Ride and Read! NEWS by Madness Photography - Onno "Berserk" Wieringa: New at Veloce Books - Off-Road Giants! 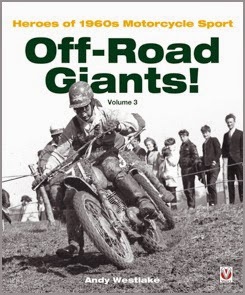 and this book is the perfect follow-up to his two previous books “Off Road Giants” volumes one and two. In this third volume Andy has once again managed to track down and interview some of the stars of this golden era in off road sport, including the former works Greeves rider and 250cc European champion Dave Bickers, ex works BSA star John Banks, and has even journeyed to Spain to interview Les Archer, the man who lifted the European 500cc crown on his works Norton in the mid ’fifties. A superbly written book brought alive by many excellent period photographs.